Hello people of the internet!!! On today’s ‘Monday Memos’ we’re going to talk about an AMAZING Country music band that you just gotta check out. If you’ve never heard of High Valley then please keep reading! These guys will instantly hook you with their incredible vocals, and insanely catchy songs. If you’re already a fan of this band then you know just how awesome they are, if you haven’t heard of them then prepare to be amazed. Ready? Ok, let’s go!!! High Valley is a Canadian Country music band that has already made a HUGE splash in the Country Music scene. Because of this, they have already opened up for music legends such as: Little Big Town, Alan Jackson, and Shania Twain. They have also worked with country music stars such as singer/songwriter/producer Paul Bradt (who has won numerous music awards both in the U.S. and Canada, and also co-wrote the song ‘For You’, which was performed by Johnny Cash and Dave Matthews for the soundtrack of the film ‘We Were Soldiers’). Most recently High Valley worked with songwriter/producer Seth Mosley (who won a Grammy Award in 2015, and has worked with Contemporary Christian music superstars such as: Michael W. Smith, Mercy Me, Hawk Nelson who we covered in a previous blog which you can check out here: http://celindareyesblog.com/2015/03/monday-memos-hawk-nelson-your-new-favorite-band-has-arrived/, Jeremy Camp, Newsboys, and many others), and co-wrote songs with Ben Stennis (who has worked with country music superstars such as: Jason Aldean, Chase Rice, Tim Hicks), Fred Wilhelm (who has worked with country music legends such as: Faith Hill, Rascal Flatts, Little Big Town) and award-winning Canadian country music songwriter Deric Ruttan. Ok, now that you know a little bit about the band, let’s get to the music! Now I really wish that I could talk about all of this music that High Valley has released because it’s AMAZING (if you want me to talk more about this band please leave a comment below), but I choose 3 songs that I feel will really get you excited about High Valley. 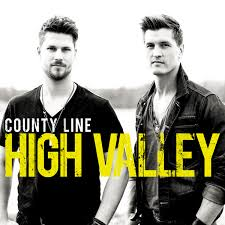 The first song that we’re going to talk about is High Valley’s cover of Bucky Covington’s 2010 single ‘A Father’s Love (The Only Way He Knew How), which was included on the band’s 2010 self-titled album. I absolutely loved this cover because High Valley slowed the song down just a bit which made it feel fresh, but were also able to keep the vibe of the original version that fans have come to love. Through this cover, High Valley is really able to make you feel the emotion of the lyrics, and you find yourself getting completely lost in the story they tell. The next song that we’re going to talk about is High Valley’s ‘Rescue You’, the 1st single off of their 2014 album ‘Country Line’. This is such a fun, high energy song, that is perfect to sing along to in the car. The message of the song is really sweet, and before you know it you WILL be completely addicted to this song. Ok, the final song that we’re going to talk about today is the band’s latest single off ‘She’s With Me’ (which you can check out the official music video for below).Personally this is one of my favorite High Valley songs, because it’s a really high energy song, with infectious lyrics, and it’s the perfect mix of country with just a touch of indie pop. You will definitely have this song on repeat for a LONG time. After hearing ‘She’s With Me’, I’m really excited to see what this incredible band will do next. All credit goes to YouTube, Instagram, Facebook, ITunes, Twitter, highvalley.com, openroadrecordings.com, Open Road Recordings, Centricity Music, Valley High, Brad Rempel, Curtis Rempel, Bryan Rempel, Little Big Town, Alan Jackson, Shania Twain, Mercury Nashville Records, Universal Music Group Nashville, Monument Records, Equity Music Group, Capitol Records Nashville, Universal Music Group, Karen Fairchild, Kimberly Roads Schlapman, Phillip Sweet, Jimi Westbrook, Arista Nashville, Sony Music Entertainment, EMI Nashville, Alans Country Records, Koch Entertainment, Johnny Cash, Dave Matthews, We Were Soldiers, Paul Bradt, Seth Mosley, Michael W. Smith, Mercy Me, Hawk Nelson, Jeremy Camp, Newsboys, Sun Records, Sun Entertainment Corp., American Recordings, House of Cash, Legacy Recordings, Dave Matthews Band, Carter Beauford, Stefan Lessard, Boyd Tinsley, Tim Reynolds, Rashawn Ross, Jeff Coffin, LeRoi Moore, Peter Griesar, Butch Taylor, RCA Records, V2 Records, PIAS Group, Columbia Records, Reprise Records, Warner Music Group, Brand-T, Brown Bannister, Steve Rosen, RMC Entertainment, Me in Motion, Reunion Records, Provident Label Group, Bart Millard, Nathan Cochran, Michael John Scheuchzer, Robin Shaffer, Barry Graul, James Bryson, Curb Records, MGM Records, Word Records, Epic Records, Fair Trade Services, INO Records, Word Records, Tooth & Nail Records, RED Distribution, Fontana Distribution, Diamante Music Group, BEC Recordings, Johnathan Steingard, Daniel Biro,, Micah Kuiper, David Niacaris, Justin Benner, David “Davin” Clark, Matt “Matty” Paige, Aaron “Skwid” Tosti, Gideon Courtney, Jason Dunn, Capitol Christian Music Group, Refuge Records, Star Song Communications, Virgin Records, Sparrow Records, Inpop Records, Jody Davis, Duncan Phillips, Jeff Frankenstein, Michael Tait, Peter Furler, John James, George Perdikis, Sean Taylor, Phil Yated, Corey Pryor, Jonathan Geange, Vernon Bishop, Kevin Mills, Phil Joel, Bryan Olesen, Paul Colman, Ben Stennis, Jason Aldean, Chase Rice, Tim Hicks, Fred Wilhelm, Faith Hill, Rascal Flatts, Little Big Town, Deric Ruttan, Broken Bow Records, Dack Janiels, RGK Records, Lyric Street Records, Disney Musc Group, Big Machine Records, Big Machine Label Group, Gary LeVox, Jay DeMarcus, Joe Don Rooney, Deric Ruttan, On Ramp, Warner Music Canada, Warner Reprise Canada, Black T Records, Bucky Covington, E1 Music, Entertainment One Music, Koch Records, Liz Hengber, Thom Sheperd, Steve Williams, Mark Miller, Young Guns Publishing, Brad Rempel, Ben Stennis, all of the businesses, companies, people, and any other original owners involved and/or mentioned in any of these videos and/or hauls, any and all companies, individuals, and/or businesses that should receive credit for anything mentioned in this blog post, and all original owners. I do not own anything in this blog. If any people, corporations, businesses, companies, etc, were not previously given credit for their work, they are given credit now and their previous absence was unintentional. All opinions expressed in this blog are my own. I wrote this blog for entertainment purposes and no copyright infringement is intended. celindareyesblog September 1, 2015 No Comments on Monday Memos: High Valley, the band that will hook you from the first note. Category: Monday Memos. Tagged: 2014, 2015, Aaron "Skwid" Tosti, alan jackson, Alans Country Records, amazing, American Recordings, Arista Nashville, artist, band, Barry Graul, Bart Millard, BEC Recordings, Ben Stennis, Big Machine Label Group, Big Machine Records, Black T Records, Boyd Tinsley, Brad Rempel, Brad Young Guns Publishing, Brand-T, Broken Bow Records, Brown Bannister, Bryan Olesen, Bryan Rempel, Bucky Covington, Butch Taylor, Capitol Christian Music Group, Capitol Records Nashville, Carter Beauford, Centricity Music, Chase Rice, Columbia Records, Corey Pryor, country, Curb Records, Curtis Rempel, Dack Janiels, Daniel Biro, Dave Matthews, Dave Matthews Band, David "Davin" Clark, David Niacaris, Deric Ruttan, Diamante Music Group, Disney Musc Group, Duncan Phillips, E1 Music, EMI Nashville, Entertainment One Music, Epic Records, Equity Music Group, facebook, Fair Trade Services, Faith Hill, featured, Fontana Distribution, Fred Wilhelm, gary levox, George Perdikis, Gideon Courtney, Hawk Nelson, highvalley.com, House of Cash, indie, INO Records, Inpop Records, instagram, itunes, James Bryson, jason aldean, Jason Dunn, Jay DeMarcus, Jeff Coffin, Jeff Frankenstein, Jeremy Camp, Jimi Westbrook, Jody Davis, Joe Don Rooney, John James, Johnathan Steingard, johnny cash, Jonathan Geange, Justin Benner, Karen Fairchild, Kevin Mills, Kimberly Roads Schlapman, Koch Entertainment, Koch Records, Legacy Recordings, LeRoi Moore, little big town, Liz Hengber, Lyric Street Records, Mark Miller, Matt "Matty" Paige, Me in Motion, Mercury Nashville Records, Mercy Me, MGM Records, Micah Kuiper, Michael John Scheuchzer, Michael Tait, Michael W. Smith, Monument Records, music, Nathan Cochran, new, Newsboys, On Ramp, Open Road Recordings, openroadrecordings.com, Paul Bradt, Paul Colman, Peter Furler, Peter Griesar, Phil Joel, Phil Yated, Phillip Sweet, PIAS Group, playlist, pop, Provident Label Group, rascal flatts, Rashawn Ross, RCA records, RED Distribution, Refuge Records, Rempel, repeat, Reprise Records, Reunion Records, RGK Records, RMC Entertainment, Robin Shaffer, Sean Taylor, Seth Mosley, Shania Twain, Sony Music Entertainment, Sparrow Records, Star Song Communications, Stefan Lessard, Steve Rosen, Steve Williams, Sun Entertainment Corp., Sun Records, Thom Sheperd, Tim Hicks, Tim Reynolds, Tooth & Nail Records, twitter, universal music group, Universal Music Group Nashville, V2 Records, Valley High, Vernon Bishop, Virgin Records, Warner Music Canada, warner music group, Warner Reprise Canada, We Were Soldiers, Word Records, youtube.